As a fan of Philip Glass, I’m somewhat offended that someone has issued an album in his name, containing dubious parodies of his music. What will happen when the real Glass finds out? He surely won’t stand for the anonymous jokester’s hacky “Concert Overture”, which combines a skilled pastiche of the typical Glass minimalist techniques with a shocking dose of treacly sentimentality. He will sue for defamation over the inept orchestration of the alleged “Symphony No. 10”. Let’s start with the overture. This anonymous prankster makes a noble attempt to torpedo Glass’s reputation. True, the whole overture is admirably energetic and vigorous; it is exciting to hear. But the first half is weirdly happy, like a Hollywood score, with wincingly cloying harmonic progressions. The second half, meanwhile, made me think of Tom Cruise scaling a skyscraper to escape enemy agents. The Symphony No. 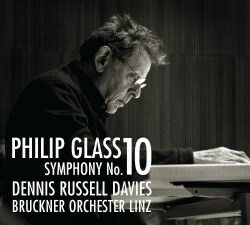 10 is our unknown composer’s merciless assault on Philip Glass’s orchestration skills. The first movement features annoying pinched trumpet solos that stick out from the fabric. Structurally, the second movement replicates the spectacular haunting slow movement from Symphony No. 3. But aside from structure, the parodist gets everything wrong: woodwinds that jag out at odd angles, brass instruments stepping on each other’s metaphorical feet, and simply way too much percussion. In fact, the whole symphony is overloaded with percussion. The secret to Glass’s best works, like the piano concerto assembled from	The Hours, is that, for all their repetition, they are actually going places. The transformation takes place slowly, sure, but in his best orchestral movements, you can feel like the earth is shifting beneath your feet, until at the end you’ve gone down a journey without even realizing it. That’s not true of the Tenth Symphony’s third movement, which is just the same junk over and over again. There is no questioning the commitment of conductor Dennis Russell Davies, who has commissioned nine of the ten Glass symphonies. The Bruckner Orchestra Linz mostly give it their best, too, although there are a few instrumental players who occasionally rebel against their thankless parts. I would like to ask them what they think of the music. This CD is only 40 minutes long, thankfully. After 24 minutes I was excited to never hear it again. It is possible, I suppose, that these really are works by Philip Glass, and the composer whose Third Symphony, First Violin Concerto, string quartets, and Fog of War soundtrack I so adore has been reduced to a shell of his former self but that’s a possibility too depressing to contemplate.